This website presents illustrations of an extraordinary artifact collection from one of the most important Native American archeological sites in southeastern North America. The Sloan site, located in the Cache River basin of northeastern Arkansas, is a group cemetery used approximately 10,500 years ago by Dalton culture inhabitants of the region. It is the oldest site of its kind in the western hemisphere. 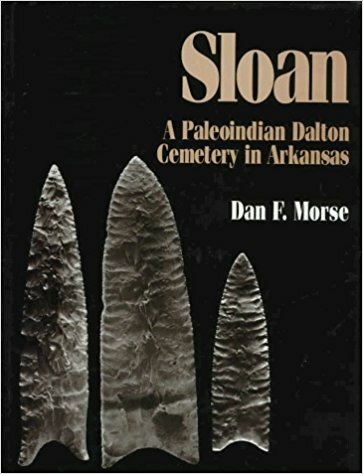 All artifacts represented on this website are from the volume “Sloan: A Paleoindian Dalton Cemetery in Arkansas” by Dan F. Morse, available now from the University of Arkansas Press. Excavated during a one-month period in 1974 by Dan Morse (Arkansas Archeological Survey research station archeologist at Arkansas State University at the time), the Sloan site produced 439 artifacts, all illustrated on this website. The assemblage consists of 146 Dalton points (including one unusually large specimen referred to as a Sloan point), 42 adzes, 33 end scrapers, 95 bifacial implements, 68 uniface tools, 35 abraders, and 20 miscellaneous stone artifacts. An especially noteworthy discovery was the distribution of artifacts in discrete clusters, many consisting of Dalton points accompanied by a selection of other tool forms. This unusual clustering raised questions concerning site function. Laboratory examination (by Dr. Jerome C. Rose and Keith Condon at the University of Arkansas) of tiny bone fragments preserved at the site revealed that most could be identified as definitely, probably, or possibly human, but none definitively non-human. This osteological evidence secured the interpretation of the site as a cemetery, and prompted additional investigations of artifacts thus understood as grave goods. Careful analysis of the Sloan artifact assemblage identified many used items, suggesting that personal goods had been included in the interments. Most of the Dalton and Sloan points, in contrast, appear to have been made specifically for interment with burials or, if they had been used, were re-sharpened before inclusion with the other grave goods. Juliet Morrow, Morse’s successor at the ASU research station, later employed tool stone source information not available to the Morse team. While the assemblage as a whole was crafted using cherts derived from a variety of local and regional geological contexts, she discovered a clear preference for material derived from the nearby Lafayette formation among the Dalton points. The single Sloan point (a large version of the Dalton point) was made of an exotic chert, and may well have served (along with other large Dalton points) more as a status display item than as a utilitarian weapon component (Morrow 2010). The results of Morse’s investigations at Sloan, extended by specialized analyses contributed by a team of well-known scholars, won acclaim with the 1997 Smithsonian Institution Press publication of Sloan: A Paleoindian Dalton Cemetery in Arkansas (Morse 1997). The book was out of print but thankfully a facsimile reprint is now available from the University of Arkansas Press. One shortcoming of the original publication is the absence of full-size artifact images. The Arkansas Archeological Survey created this website to address that issue by providing full-scale, multiple perspective digital color images of the complete Sloan site assemblage. To put these images into a regional cultural context, we provide here a brief summary of Dalton culture and land use patterns. The Dalton culture in Southeastern United States straddled the temporal and cultural boundary separating Late Pleistocene (Ice Age) Paleoindian cultures and subsequent Archaic cultures inhabiting the area as emergent Holocene (modern) environments developed (Morse and Morse 1983:71). Paleoindians organized their subsistence economies around the predation of large migratory mammals, most of which are now extinct. Archaic period communities centered their food-getting activities on local foraging of a much wider variety of animal and plant foods. 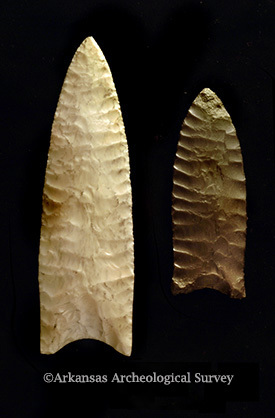 Possessing a chipped stone technology derived from earlier Paleoindian Clovis technologies, Dalton communities are considered by some scholars (e.g., Gillam 1996, 1999; Morse 1997) to represent a late Paleoindian way of life. Other scholars, emphasizing economic dependence on post-Pleistocene animal and plant resources, regard Dalton culture as an Early Archaic phenomenon (Morrow 2010; cf. Anderson and Sassaman 2012:61-64). The characterization of Dalton culture by Dan and Phyllis Morse (1983) as a transitional “efflorescence”—at least in the Central Mississippi Valley—is a useful perspective that centers attention on its most distinctive material attributes. One diagnostic element of Dalton culture is a stone tool-making technology that generated a variety of forms, including a distinctive bifacial “point” that could be used as a projectile tip, a cutting implement, or, with further modification, as a hafted drill or perforator. Specimens with snapped blades could be refurbished for use as hide scrapers. Other forms of scraping and engraving tools, along with a range of informal tools, were fashioned from flakes specially struck from chert cores. The earliest heavy woodworking tool in eastern North America—the Dalton adze—was also chipped from specially selected cobbles. Coarse-grained igneous and sedimentary rocks provided raw material for making pounding, grinding, and abrading implements. Settlement and land-use strategies comprise another distinctive characteristic of Dalton communities. Two archeological sites in the L’Anguille River basin of northeastern Arkansas illustrate this pattern. The Lace site is a base camp occupied for a period of time sufficient to alter the natural soil profile, producing a midden of organically enhanced sediments containing a wide range of Dalton implements (Morse and Morse 1983:82-84). The Brand site, in contrast, revealed distinctive clusters of hunting and butchering tools suggesting use as a temporarily occupied site for processing deer carcasses and hides (Goodyear 1974). Other kinds of special purpose sites include quarries, and places where nuts or other plant foods were collected or for the capture of fish, waterfowl, and small animals. Cemeteries maintained for the burial of deceased community members represent the final, and most distinctive element of Dalton land use practices. The Sloan site is the only known example; yet, the thoroughness of its investigation established its unparalleled importance for Dalton culture studies. This website is designed to be used as a source of full-size, color artifact images for Sloan volume readers to consult as they work their way through the various chapters. Users will note the presence of digital watermarking on these images. 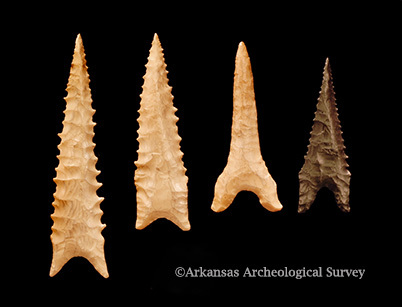 Unmarked images suitable for publication can be requested from the Arkansas Archeological Survey by filling out and submitting the permission form linked here. Photographs by M. Jane Kellett.